William Arthur "Bill" Weasley (b. 29 November, 1970) was the first child of Arthur and Molly Weasley (née Prewett) and the eldest brother of Charlie, Percy, George, Fred, Ron, and Ginny. He attended Hogwarts School of Witchcraft and Wizardry from September 1982 to June 1989, and was both a prefect and Head Boy. After graduating, he went to work for Gringotts Wizarding Bank as a Curse Breaker, working in Egypt. In 1995, he returned to England and joined the reconstituted Order of the Phoenix to face the reborn Lord Voldemort. During this time, he started dating Fleur Delacour, and eventually asked her to marry him after a year of seeing each other. During the Battle of the Astronomy Tower, Bill was severely injured by the werewolf Fenrir Greyback. Although he wasn't turned into a werewolf, he did develop some wolfish tendencies such as a liking for very rare steaks. He married Fleur on 1 August, 1997, although their wedding was disrupted by the arrival of Death Eaters following the fall of the Ministry of Magic. Bill and Fleur then moved to Shell Cottage, where they assisted Harry, Ron, and Hermione after their escape from Malfoy Manor. Bill later fought in the Battle of Hogwarts alongside the rest of the Order, and survived. Following the war, Bill and Fleur had three children; Victoire, Dominique, and Louis Weasley. Bill lived with the Weasleys at the family home, the Burrow, and attended Hogwarts School of Witchcraft and Wizardry from 1982 to 1989. He was sorted into Gryffindor house. In his third year, he took Muggle Studies, Care of Magical Creatures, Divination, Arithmancy and Study of Ancient Runes. In his fifth year, he became a prefect, and obtained twelve O.W.Ls. In his seventh year, he was made Head Boy. At some point, Bill had a pen-friend at a school in Brazil. When his pen-friend wanted him to go on exchange trip, Bill had to decline because his parents could not afford it. His pen-friend, though, was offended and sent him a cursed hat that made his ears shrivel up. After graduating from Hogwarts, Bill went to work for Gringotts Wizarding Bank as a Curse Breaker in Egypt. During the summer of 1993, the whole Weasley family went to Egypt on holiday after his father won seven-hundred galleons in the annual Daily Prophet Grand Prize Galleon Draw. Bill took his family on a tour of the Egyptian tombs while they were there. In the summer of 1994, Bill returned to the Burrow to attend the Quidditch World Cup with his family. During his stay, he met his youngest brother Ron's best friend, Harry Potter, for the first time. When the Death Eaters decided to stir up trouble in the aftermath of the Irish victory, Bill assisted the Ministry of Magic. During the skirmish, Bill was injured with a deep cut on his arm. Bill later escorted his siblings, Harry, and Hermione to King's Cross station to see them off to Hogwarts. In 1995, Bill took more time off work to travel to Hogwarts with his mother to support Harry during the Third Task of the Triwizard Tournament. It was during this time that he met Fleur Delacour, who was attracted to him from the start. Following the death of Cedric Diggory and the revelation that Lord Voldemort had returned, Bill immediately set out to inform his father of the news, and that Albus Dumbledore would be contacting him. Bill joined the Order of the Phoenix and applied for a desk job in England, so he could help the Order more effectively. Although he missed the tombs, he did have one compensation — Fleur Delacour had taken a part-time job at Gringotts to improve her English, and the two began dating. He was often involved in planning sessions and was used to gauge where the goblins' loyalties lay. During Christmas of 1995, Bill visited his father at St Mungo's Hospital for Magical Maladies and Injuries several times after he had been attacked by Nagini. With the wizarding world at large aware of Lord Voldemort's return in the wake of the Battle of the Department of Mysteries, Bill asked Fleur to marry him after they had been dating for a year. In the summer of 1996, she stayed at the Burrow for several weeks to get to know Bill's family. However, her blunt nature rubbed Mrs. Weasley and Ginny the wrong way, and they thought Bill could do better than her. In June 1997, Bill was one of the Order members tasked by Dumbledore to patrol Hogwarts during his absence when he and Harry went to search for one of Lord Voldemort's Horcruxes. That night, Death Eaters broke into the school with the help of Draco Malfoy, and during the battle that ensued, Bill was badly injured by the werewolf Fenrir Greyback. His face was slashed and ripped, and because of the nature of his attacker, the wounds were cursed. Although Greyback was not transformed at the time, the wounds were contaminated. Bill did not become a werewolf, but did develop a liking for very rare steaks. Strangely, it was his injuries that finally convinced his mother that Fleur was the right choice for him. Mrs. Weasley thought their union was based on physical attraction, but Fleur showed that she loved him no matter what he looked like, and the two women reconciled over his hospital bed. A few days later, he attended Dumbledore's funeral. In July 1997, Bill was one of the members of the Order of the Phoenix who assisted in transporting Harry to safety before the protective charm that kept him safe at the Dursleys was broken. Part of the plan involved Fleur disguising herself as Harry, and the two left 4 Privet Drive on a thestral. During the Battle of the Seven Potters, Bill saw Alastor "Mad-Eye" Moody killed by Voldemort, and they were chased by a dozen Death Eaters, but escaped unharmed. He later volunteered to assist Remus Lupin in the search for Moody's body to give him a proper burial, but they could find no trace of it. Bill and Fleur were married on 1 August, 1997. Their reception, however, was disrupted by Death Eaters, who were able to break the protective spells around the Burrow after a successful coup d'état against the Ministry of Magic and the death of Rufus Scrimgeour. Although they were questioned, the attendees were free to go. Bill returned to work, and he and Fleur moved to their own place, Shell Cottage. Later in the year, Bill's brother Ron came to stay with them after abandoning Harry and Hermione during their Horcrux hunt. Although disappointed in his brother, he could see just how sorry he was, and did not let on to the rest of the family that Ron was there. After Harry, Ron, and Hermione escaped from Malfoy Manor with several other prisoners (Luna Lovegood, Dean Thomas, Griphook, and Mr. Ollivander), they took refuge at Shell Cottage. Bill took them in and allowed Harry to bury the remains of Dobby in his garden. Realising that the enemy was aware that the Weasleys were supporting Harry openly, Bill and his father took the family into hiding using the Fidelius Charm. As a result, Bill had to give up work, and he became the Secret-Keeper of Shell Cottage. In the following weeks, Bill played host to the escapees and realised that Harry was planning something with Griphook. Although not privy to the details, he counselled Harry on the way goblins perceived things and warned him about them. Shortly after Harry, Ron, Hermione, and Griphook left, he was alerted to Neville Longbottom's call to arms at Hogwarts, either through the Order of the Phoenix, or the two members of Dumbledore's Army that were staying with him, Luna and Dean. Either way, he and Fleur Apparated to the Hog's Head and travelled to the Room of Requirement. Bill was one of the Weasley members that didn't want Ginny to fight due to her age. Bill fought in the Battle of Hogwarts and survived, but the victory was tarnished by the death of his brother, Fred. Following the war, Bill and Fleur had three children, Victoire, Dominique and Louis Weasley Victoire was born on the anniversary of the Battle of Hogwarts, thus her name, which means 'victory' in French. She also seemed to have inherited her mother's looks, as she was noted to be good looking. Victoire also seemed to have a relationship with Teddy Lupin. As of 2013, Bill was still employed as a Curse-Breaker for Gringotts, and had returned to his work in Egypt. Mrs Weasley : " [...] with a horrible, great fang on it, really, Bill, what do they say at the bank?" Bill: "Mum, no one at the bank gives a damn about how I dress as long as I bring home plenty of treasure." Mrs Weasley : "And your hair's getting silly, dear. I wish you'd let me give it a trim [...] "
Bill was tall, thin, handsome, and had red hair like the rest of the Weasley family. He wore it long and in a ponytail, and he had an earring with a fang dangling from it. He wore clothes that would not be out of place at a rock concert, and he favoured boots of dragon hide. He was once called a "long-haired pillock" by Rita Skeeter in an article about the Gringotts Curse Breakers. However, when Harry first saw Bill, he was described as "cool." In 1997, he suffered severe facial wounds at the hands of the vicious werewolf Fenrir Greyback during the Battle of the Astronomy Tower. Although untransformed at the time, Greyback's lycanthropy caused the wounds to be cursed, and they could not be treated totally, leaving him heavily scarred. At his wedding, however, he looked so happy one could "hardly tell he had ever met Fenrir Greyback." Mrs. Weasley: " [...] Bill and Fleur... well... what have they really got in common? He's a hard-working down-to-earth sort of person, whereas she's —"
Ginny: "A cow. But Bill's not that down-to-earth. He's a Curse Breaker, isn't he, he likes a bit of adventure, a bit of glamour [...] "
Bill was laid back and easy going, and described as "cool". However, he had a serious side, being a high academic achiever while a student and being Hogwarts Head Boy his seventh year. He was knowledgeable about wizard-goblin relations for his work. Despite being the eldest of seven children, he had a lively sense of humour and knew how to have fun. He was very brave, working as a Curse Breaker and joining the Order of the Phoenix to fight against Lord Voldemort. After his mauling at the hands of Fenrir Greyback, it was feared that his personality would change, and that he would take on some wolfish characteristics. However, Bill's personality remained intact, although he did develop a liking for very rare steaks. When Bill met Harry Potter for the first time in 1994, Harry was taken by surprise at Bill's cool, laid-back demeanour; from everything Harry had heard from Ron, he had always pictured Bill as an older version of Percy, who was more serious and stuffy than all his siblings. Bill was a skilled wizard, earning twelve O.W.L.s in his fifth year. Defence Against the Dark Arts: Bill was skilled with counter curses, becoming a Curse Breaker. He survived the Battle of Hogwarts, fighting off many Death Eaters, avenging his deceased brother Fred. Arithmancy: He also had some skill in Arithmancy, as becoming a Curse Breaker requires at least an O.W.L. in this subject. Duelling: He was able to hold his own in many battles, the Battle of the Astronomy Tower, the Battle of the Seven Potters and the Battle of Hogwarts. Languages: It is likely that Bill speaks Gobbledegook due to the fact that he has worked with Goblins at Gringotts bank ever since he left school. Wand: The wand of Bill Weasley is of unknown length, wood and core materials. Like most wizards and witches in Great Britain, he likely purchased it at the age of eleven at Ollivanders before beginning his education at Hogwarts School of Witchcraft and Wizardry. Bill had a good relationship with all his family members, but seemed to be particularly close to Charlie, the sibling closest to him in age and the one he chose as best man at his wedding. Bill's younger siblings tended to look up to him, especially his only sister, Ginny. She supported Bill whenever their mother criticised his choice of hair and clothing, and a large part of her initial disdain for Fleur Delacour was her belief that the witch was not good enough for her brother. It is unclear whether Ginny ever made her dislike for Fleur known to Bill, but she eventually accepted their relationship. Ginny also tended to take Bill's opinion very seriously; when she, Harry, Ron, and Hermione were discussing their hatred of Snape, she mentioned "Bill doesn't like him either," as if her older brother's opinion should settle it. Ron also admired Bill, partly because he was one of his only siblings who did not tease him. Towards the end of 1997, when Ron temporarily abandoned Harry and Hermione during their search for Voldemort's Horcruxes, he stayed with Bill and Fleur at Shell Cottage. Although Bill was not impressed by his brother's actions, he realised how sorry Ron was about it and never mentioned it. Bill also got along well with his parents, though his mother constantly tried to pressure him into cutting his hair and not dressing as flashily as he liked to. She also disapproved of his choice of wife initially, though she came to accept Fleur once she realised how in love the couple was and their liking of one another was not based on looks as she had first believed. Bill fought in the Battle of Hogwarts in 1998 with the rest of his family. He was devastated by his younger brother Fred's death and was seen comforting his wife Fleur in the Great Hall. Bill also became the uncle to many Weasleys, through his brothers. He also had two Potter nephews and one Potter niece, through Ginny's marriage to Harry Potter, Bill's brother-in-law. George: "Remember old Fleur Delacour? She's got a job at Gringotts to "eemprove 'er Eeenglish" —"
Fred: "And Bill's been giving her a lot of private lessons." Bill met Fleur Delacour in June 1995, when he accompanied his mother to Hogwarts to support Harry Potter during the Third Task of the Triwizard Tournament, in which she was also a Champion. Fleur was attracted to him immediately, eyeing him from a distance. Shortly after, Bill moved back to England to work for the Order of the Phoenix, taking a desk job at Gringotts. Fleur had taken a part-time job at the bank to improve her English, and the two began dating shortly after. After a year together, Bill proposed, and Fleur accepted. His mother felt it was too soon for him to get married and worried that he was only doing it in response to the return of Lord Voldemort. In addition, Fleur's blunt attitude and tendency to speak her mind irritated both Molly and Ginny. Mrs Weasley became convinced that their feelings for each other were based on physical attraction, and the adventurous side of each other — him as a Curse Breaker, and her as a Triwizard Champion. Following Bill's scarring during the Battle of the Astronomy Tower, Fleur showed her feelings for Bill by declaring that she still loved him no matter what he looked like, and her insistence that she would take care of his injuries. Her declaration convinced Mrs Weasley that her son had made the right choice, and the two women finally put aside their differences. Bill and Fleur married on 1 August, 1997, and set up a home of their own, Shell Cottage. Their union produced three children: Victoire, Dominique, and Louis. After the Second Wizarding War, Bill and Fleur had three children; Victoire, Dominique and Louis. It is likely he had a good relationship with all of them. In 2017, Victoire was seen snogging Teddy Lupin. Bill first met Harry Potter in 1994. Harry found Bill cool, but he expected Bill to be like an older version of Percy Weasley. Harry was Ron's best friend, and Bill was sometimes like an older brother for Harry, too. He visited Hogwarts, along with his mother in 1995, during the Triwizard Tournament, at the time Harry was taking part at his third task. Harry was very glad to see them, because he did not expect anyone to come to watch him. Bill and Harry fought together in the Battle of the Astronomy Tower. After the battle, Harry was shocked when he learned about Bill's injuries from Fenrir Greyback. He participated in Bill and Fleur's wedding, and later stayed for a short time at their house, Shell Cottage. Bill also advised Harry not to attempt to deceive goblins. They also fought together in the Battle of Hogwarts and survived the war. After the war, they became brothers-in-law, as Harry married Bill's younger sister, Ginny. Bill met Hermione Granger in the summer of 1994, prior to Hermione's fourth year at Hogwarts. Although they were not very close, Hermione seemed to like Bill, and the fact that he was a top student, which she heard from Ron and Percy. Hermione fought alongside Bill at the Battle of the Astronomy Tower; after the battle, Hermione visited Bill at Hogwarts' hospital wing, while she, members of the Order of the Phoenix and others discussed Dumbledore's death at the hands of Severus Snape. Hermione participated at the wedding of Bill and Fleur, and she later stayed for a short time at their house. Bill was upset when he heard that Hermione had been tortured by Bellatrix Lestrange. After the war, Hermione became Bill's sister-in-law, as she married Ron. Bill also had several nieces and nephews through his siblings; Molly and Lucy, Percy's children; Fred and Roxanne, George's children; Rose and Hugo, Ron's children; James, Albus and Lily, Ginny's children. He possibly had a good relationship with them, too. Bill became a member of the Order of the Phoenix in 1995, after Voldemort's return. He had a good relationship with the most fellow members. He seemed to like Albus Dumbledore, who was his headmaster at the time Bill attended Hogwarts. Bill was loyal to Dumbledore, and fought for him at the Second Wizarding War, after Dumbledore's death. He seemed to be a friend of Remus Lupin, as they fought together in several battles of the Second War. After the Battle of the Seven Potters, they both left the Burrow in order to search for Mad-Eye Moody's dead body. When Lupin was killed during the Battle of Hogwarts, his body was put near Fred's. It is possible that Bill cried for Lupin, too. He was also friendly with Alastor Moody. In 1997, Moody was the leader of a group that escorted Harry Potter to a safe place. However, Moody was killed. Bill, along with Fleur, was the one to witness his friend's death by Lord Voldemort and tell about it to the others, as well. Bill also appeared to be on good terms with Nymphadora Tonks. Bill and Tonks fought together in many battles and were close in age; Bill was also one of the first to learn about her childbirth. He was also friendly with Kingsley Shacklebolt. They fought together at many battles, such as the Battle of the Seven Potters and the Battle of Hogwarts. They both survived the war; Kingsley became Minister for Magic. Minerva McGonagall appeared to be on good terms with Bill's family. She was Bill's head of house and Transfiguration professor. They both participated at the Battle of the Astronomy Tower and, after the battle, she visited Bill at the hospital, and they discussed Dumbledore and Snape. It was stated by Ginny Weasley that Bill did not like Severus Snape. After Snape killed Albus Dumbledore, Bill was angry with Snape; however, he learned that Snape was on their side, and that Dumbledore had asked Snape to kill him. It is unknown how he reacted. Though most members of the Order of the Phoenix were killed by Death Eaters. Bill and his family were among the few others who managed to survive. The name "William" comes from the Germanic name Wilhelm, which was composed of the elements wil "will, desire" and helm "helmet, protection". Bill is portrayed by English actor Richard Fish in the film adaptation of Harry Potter and the Prisoner of Azkaban and Irish actor Domhnall Gleeson, son of Brendan Gleeson, in Harry Potter and the Deathly Hallows: Part 1 and Harry Potter and the Deathly Hallows: Part 2. 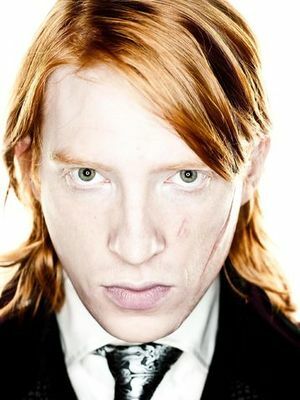 In the third film, he only appeared in a photo of the Weasley family in Egypt. Bill was omitted from the film adaptations of Goblet of Fire, Order of the Phoenix and Half-Blood Prince, but appeared in the adaptations of The Deathly Hallows. Despite Bill not being attacked or even appearing in the film adaptation of Harry Potter and the Half-Blood Prince, it is simply explained in Harry Potter and the Deathly Hallows: Part 1 that he was attacked by a werewolf named Fenrir Greyback. Domhnall Gleeson's favourite line as Bill was "Mad-Eye's dead," as his father, Brendan Gleeson, portrays Mad-Eye Moody. Coincidentally, Domhnall Gleeson portrays Bill in the Harry Potter series, as he is described as having a close resemblance to Mad-Eye Moody (due to the deep scars inflicted to his face by Fenrir Greyback) who is played by Domhnall's father Brendan in the film adaptations. Following Fenrir's attack, Bill is described as follows: "His scars were as bad as ever; in truth, he now bore a distinct resemblance to Mad-Eye Moody, though thankfully with both eyes and legs still intact." This page was last edited on 30 June 2015, at 15:45. This text is available under the GNU FDL and may have been adapted from the Wikipedia article about William Weasley (history).